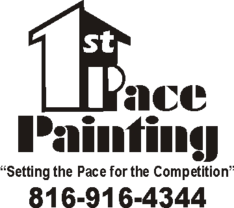 First Pace Painting, LLC in Kansas City offers a full range of services which include but aren't limited to: power washing, staining and wood restoration, cabinet refinishing, interior/ exterior painting, drywall repair/ texture, and wood repair/replacement. "Excellent!!!! Professional, cleaned up everything after the job was finished; friendly. We cannot say enough good things about Luke and his crew!!!!! Will use them again when needed!!!!!" "Had ceilings painted, and deck power washed & painted. Both jobs were handeled with professionalism & expediancy with minimal of disruption." "This ol' house" needed a lot of work due to wood rot & general aging. After 4 days of wood preparation including replacing boards, fascia in several spots, window sill pieces, etc, the crew then caulked everything & did a beautiful job painting. The crew was respectful, polite, & friendly. I would not hesitate one second to have First Pace Painting bid on other jobs in the future. If you're looking for a quality painter, then you owe it to yourself to contact & use this company." "The hard working guys at First Pace Painting painted my basement walls & ceilings & WOW!! was I impressed by their professionalism & quality of work. I have always been so embarrassed to show people my basement but not anymore!! Now I show everyone my basement who comes in my home. If you are thinking about painting the interior or exterior of your home then call First Pace Painting & you won't be disappointed." "They went out of their way to do a good job. They always pay attention to details. They went the extra mile. I am happy with their services." The paint job is AWESOME!!! We are super happy with it! Your guys were super polite and worked very hard the entire time - please make sure you tell them thank you for us! We the Swanson's, Marv and Ann, have been residents at Kingswood in a villa for 12 years. We would like to say thank you for our update project. Luke Pace and his four painters have been wonderful. They were very professional, polite, quite and talented. We would highly recommend them to anyone looking for painters. You and your crew are exceptional. Hard working, smart, willing to go the extra mile. Thank you!